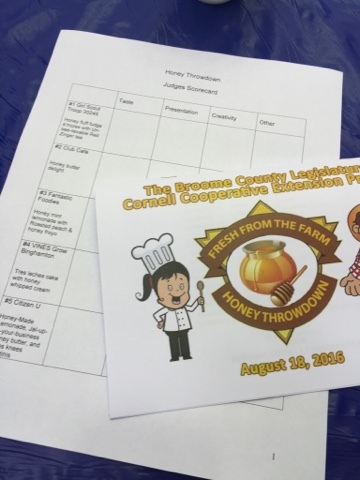 This is the fourth year the Broome County Legislature asked me to come be a part of its Fresh From the Farm Throwdown, a partnership with Cornell Cooperative Extension to expose young people in the community to locally grown foods and how to prepare them. 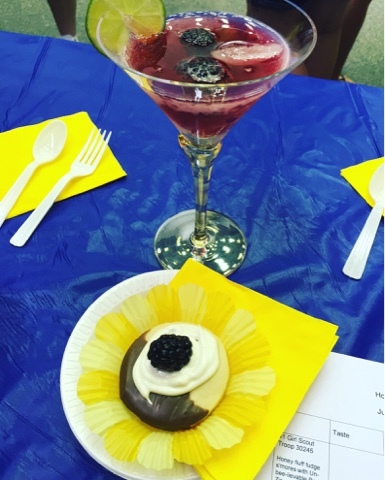 I serve as a "celebrity" judge (insert cynical laughter here) of the dishes the various youth groups conjure up utilizing an in-season agricultural product each year. 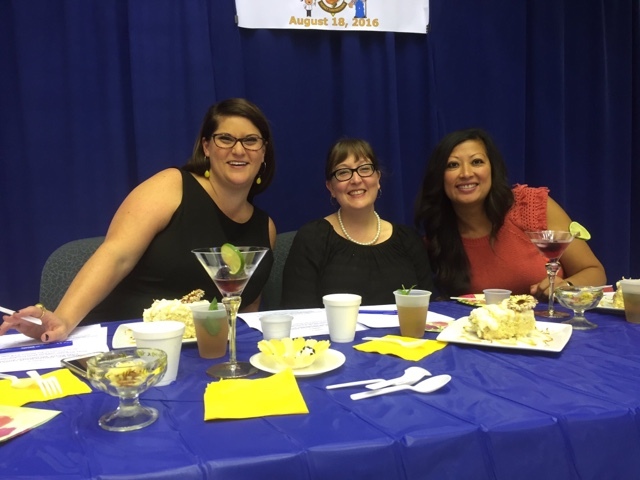 This year, local honey was the ingredient of choice for the Throwdown, and my fellow judges Kristen Cox Roby and Sue Chinyavong were the most fun foodies ever to experience all the wonderful treats the kids cooked up. Kristen writes about food for the Press & Sun Bulletin and Sue runs my new favorite pho and coconut rice hangout, Teasure Ice Cream, in Endwell. Team 1 was Girl Scount Troop 30245 AKA Francesca, Gianna, Delaney and Sarah. Let me just underscore the extreme Jedi skills of these girls, who experimented with subbing in honey for sugar in a variety of crackers and cookies until they came up with a moist shortbread to serve as the base for their honey fluff fudge s'mores. With this delectable s'mores hybrid, we also received a goblet of sweet/tart red zinger iced tea, sweetened with honey from McRey Farm. The kicker to the s'mores was the fluff piled on the fudge-dipped cookie - it was made with honey, and delivered a punch of the syrupy, floral sweetness that plain corn syrup can never equal. It was all presented rather adorably, and that's why this selection won our prize for Best Presentation. Team 2, the Club Cafe gang from the Boys & Girls Club of Western Broome, actually run a restaurant that's open to the public a few hours a week at the club. 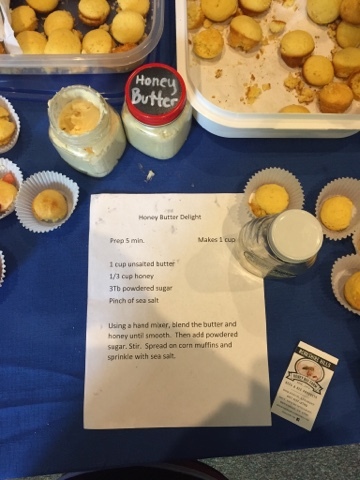 Amierah, Luke, Aliviya and Quanez used honey from Berkshire Hills Honeybee Farm for their honey butter delight, smeared on top of corn muffins. 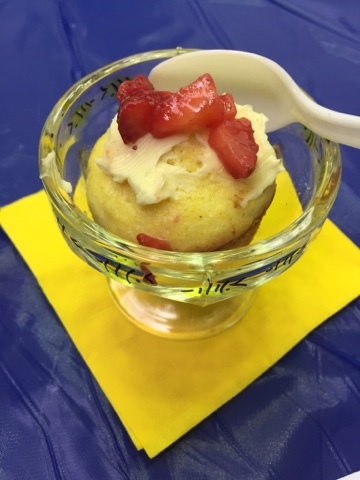 They topped the muffins with a smear of the honey butter and chopped strawberries, and sprinkled the whole shebang with some sea salt to finish. We found the addition of the salt to be so different and kind of nouveau, and awarded them the Most Creative award for their dish. Sea salt and honey pie, the creation of Team 3, the Fantastic Foodies, is the kind of dessert that is so sweet, your teeth send up signals of protest to your brain immediately as you bite into it. However, your brain's pleasure centers are all lit up already, sending out mental fireworks and moaning noises to your lips, and at that point, your teeth and their dumb cavity concerns barely register. Eve, Kirsten, Kennedy, and Logan? You ladies made us a dessert so complex and ooey-gooey delicious, we didn't care in the slightest that it was a dentist's nightmare. The juicy, fresh peach frozen yogurt on top added just enough tartness to stand up to the maxed out honey flavor of the pie, but the real genius was the honey mint lemonade, which employed fresh garden mint to stunning effect - a palate cleanser for this multi-dimensional, brilliant dessert. I would definitely pay money for this dish in a restaurant, and I encourage local pastry chefs to reach out to these youngsters for their recipe. Unsurprisingly, it won both Peoples Choice and Best Overall. 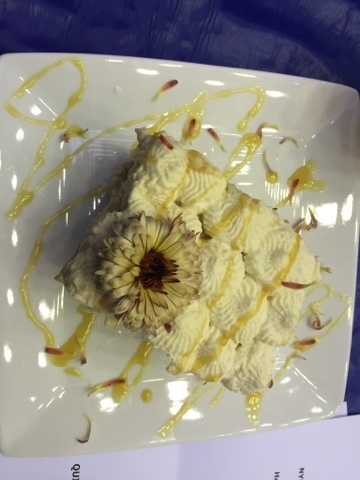 Team 4 brought the thunder with a massive tres leches cake in which all the sugar components were made with honey from Earl's Honey. VINES has competed in the Throwdown every year, and you've read here before about how these kids grow all their own food in their urban garden. 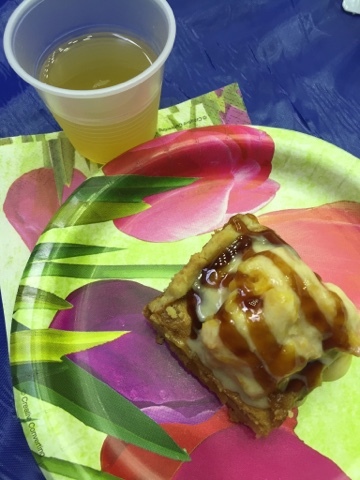 This year's team, made up of Quitajah, Ariel, Sage, James, Joshua, Jonathan, and Destini, knocked it out of the park with their very sweet, super moist layer cake with honey whipped cream and honey-caramel drizzle. There was no mistaking the rich taste of honey in this confection. 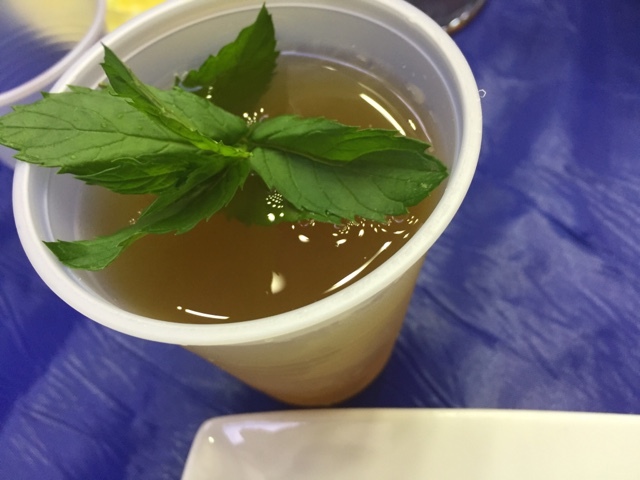 They also made us a tea with mint and honey in it, and again, the mint was a refreshing antidote for the cloying sweetness prepared for us by the bees and the kids. 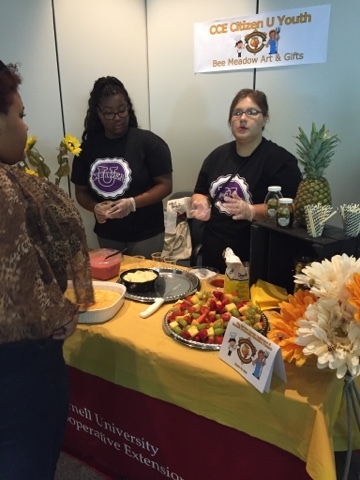 VINES took home the award for Most Local Products. They even grew the sumac flowers garnishing the cake! The final group, Team 5, was Citizens U, another returning squad. 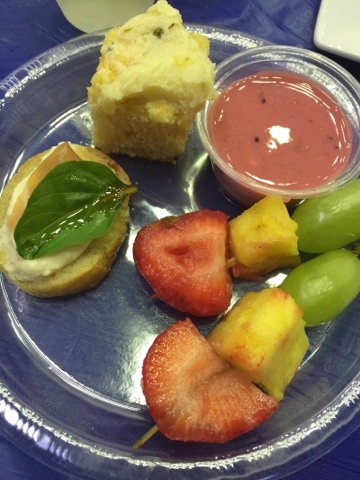 Nyeatwig, Shazaria, Esther, Kiara, and Emroidery made us a complete tasting plate of inspired honey dishes, including crostini, jalapeño honey butter, fruit, dipping sauce, and honey lemonade. 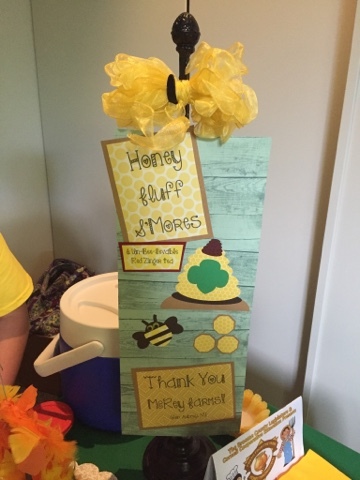 You want to make something awesome with honey? Roast up a jalapeño chile, and dice that into some softened butter with a drizzle of local honey. That stuff is dynamite! We also loved the crostini, which gave us a salty bite of prosciutto and a licoricey leaf of basil with our honeyed ricotta. Citizen U won our award for Best Taste. Overall, this group of kids did a remarkable job, through creativity and a lot of hard work, with this year's featured ingredient. I was a little surprised there wasn't a more savory dish in the mix - my favorite use of honey this time of year is equal parts honey and butter glazing slender green beans, seasoned with lots of salt and pepper to keep them from veering too sweet. But, I'll tell you, I came up with that recipe in my mid-20s. At these kids' ages, I too, would probably have chased the sweet preparations with reckless abandon! We had great food this year (that pie. THAT PIE! ), but what I love most about this event is that it forces so many young people into the kitchen to really dissect a locally-grown food and figure out how to cook it. Plus, the kids' pride of their dishes is so evident - they develop the recipes themselves, often through a good bit of trial and error - and to be rewarded for that hard work lays a really wonderful foundation for a lifetime of kitchen experimentation. 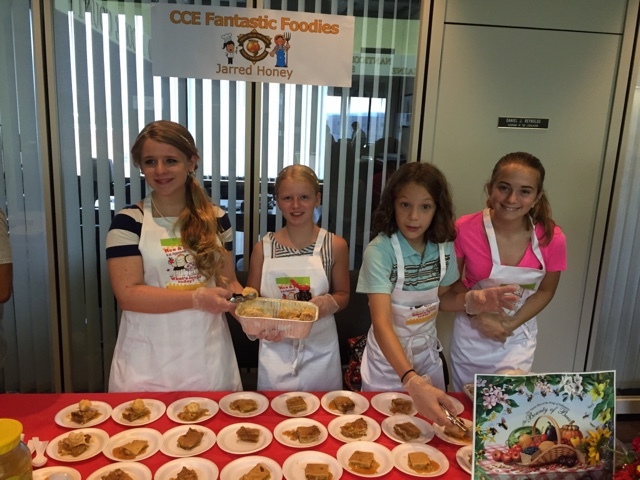 There are so few opportunities these days for kids to fall in love with cooking, and I'm enthusiastic about supporting any of them that I can. 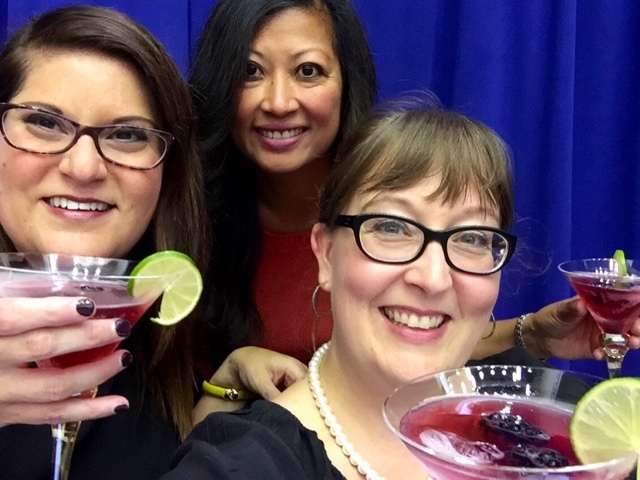 Oh right, it was also pretty fun to be on an extreme sugar high with these two;) Congratulations to all of this year's Honey Throwdown participants! You are all the bee's knees! My personality is big; my hunger is bigger!